Novalok Ulti Range is an attractive and economically priced shelving system for use in office, retail and any professional areas. The Ulti range has unique powder coated capping on all its framework uprights that simply ‘clips’ on and creates a visually appealing shelving system. Static bays are mounted on adjustable feet. Mobile bays are mounted on chassis with 4 swivel castors. The standard colour is Silver Pearl powdercoat, however Ulti can be finished in any standard powder coat colour if required. Rails are rebated to hide the edge of the board. 1000kg per module loading capacity. Easily adjustable shelf heights in 50mm increments. 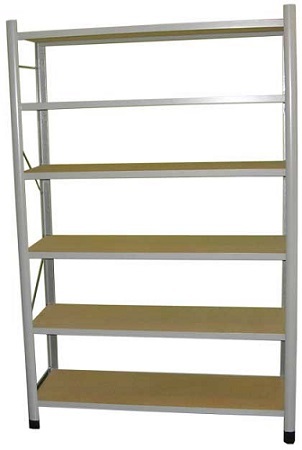 Shelf capacity from 150kg-500kg per shelf level depending on beam lengths. Available in static bays or on castors as a trolley. ULTI comes in standard height of 1800mm Custom sizes available if needed.